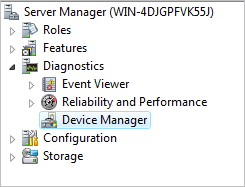 Windows Server 2008 x64 does not ship with a Bluetooth stack, and why should it? It is a Server after all. However, if you’re like me and use the server line of products as your primary operating system on desktops and laptops, this tutorial will show you how to install and enable the Bluetooth stack so that you can connect your mouse, keyboard or other mobile devices via Bluetooth. I’ve found a number of articles on the net to solving this problem, most of them not so easy or automated. The majority of the posts comment on grabbing the Windows Vista x64 Bluetooth stack drivers and modifying them for Windows Server 2008 x64. Although you could probably do this by following lengthy posts, I have taken the liberty of uploading drivers which have already been modified. These can be downloaded by following a link later in this article. 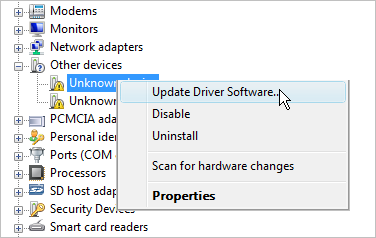 Before going any further install all the drivers which are published by your hardware vendor for Vista x64. This will ensure that any drivers which were not picked up by Windows Server 2008 installation process will now be installed. Ensure that you choose Windows Vista x64 when selecting operating system type. Before you can use Bluetooth on your Windows Server 2008, you will need to go to the Microsoft bluetooth stack download site. Well you could go to the Microsoft bluetooth stack download site if there was such a place. Unfortunately there isn't. We have however, made your life easier and you can now Download the modified Microsoft Bluetooth Stack x64 Drivers. Save and unzip them into a new folder on computer. 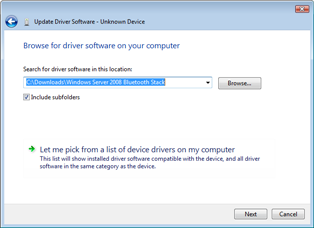 On the Browse for driver software on your computer dialog, click the Browse button and browse to the folder which contains the unzipped copy of the Microsoft Bluetooth Stack drivers you downloaded previously. 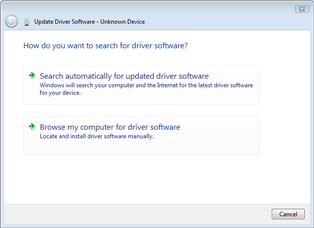 Click Next, and follow the instructions to complete the driver update. Repeat steps 4 thru 7 for each unknown device. Now that you have downloaded the Microsoft bluetooth stack drivers, you could install your Bluetooth device; but for added functionality you may also want to load vendor specific software to expand the functionality. The next steps are optional. Click on the Download Software link in the left margin. Click on the Software for Microsoft keyboard, mouse and fingerprint readers link. In step one, select Mouse. 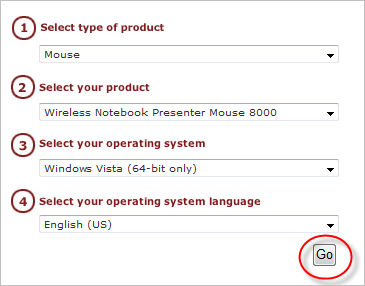 In step two, select a wireless Bluetooth mouse, I have chosen Wireless Notebook Presenter Mouse 8000, because that’s what I use. In Step three, select Windows Vista (64-bit only). In Step four, select English (US). On the page that comes up, click on the IntelliPoint 6.3 64-bit for Windows Vista link and download the file to your desktop. Double click the downloaded file to install the Bluetooth stack. When you are prompted to insert the Bluetooth dongle, simple click cancel to exit. By this stage you should see the Bluetooth Icon on your desktop and will be able to add your mouse or other Bluetooth devices. To add your device simply click the Bluetooth icon in your tray and follow the prompts to add your devices as per usual. This tutorial gave an easy way to enable and install Bluetooth functionality in Windows Server 2008 x64 and further expands on recreating the Windows Vista experience by installing Bluetooth vendor specific software.